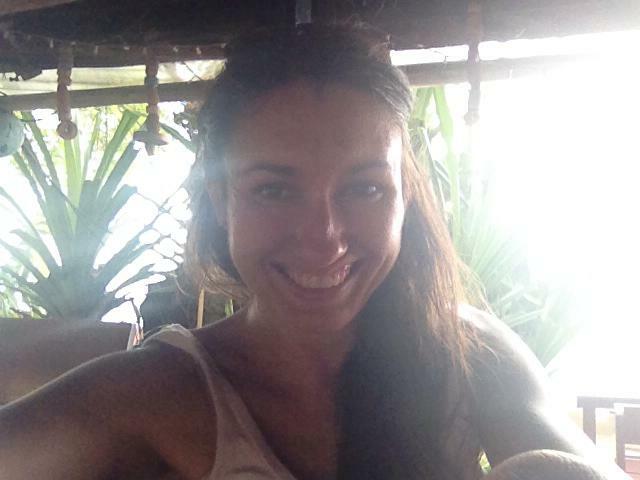 I have arrived back in Phuket and it feels as expected, like coming home. Peace. Calm. Deeply present in my body. Tickly threads of joy. I have peeled off my winter layers and any worries have been left behind. It’s replaced by everything that makes me feel expansive and free. Warm weather. Bare feet, arms and legs. Living outdoors. Riding a bike, rushing the wind. Watching the light and the clouds. Tonight, sunset watching. Tomorrow, diving. I am surrounded by green; tall tropical trees and rustling palms. I was awoken before dawn by the chorus of birds and crickets singing their songs loud giving it everything they had. Smile. Rollover. Joy. It feels like I only left here last week, not 16 months ago but the returning is different this time. I have a ticket back home to Melbourne, it is heavy and like an anchor. I don’t feel the excitement and adventure of open-ended freedom. But it’s okay. I have three weeks to soak all of this energy in and revel in all that I love here. The flight to Kuala Lumpur was long, 9 hours, cramped, cold and uncomfortable, sleeping fitfully. Despite this, my waking moments were filled with wonder, witnessing everything I love about flying through the night and chasing sunrise. Taking off from Melbourne. 45 minutes past midnight. The night sky, cloudless. Hanging in the black, a perfect half moon, lying relaxed on its back. Below, the rose gold and copper lights of suburban Melbourne, a sprawling grid fading to blackness. Hours later, I wake up from a shallow sleep and look out the window to see if we are over land or sea. Below, the earth is mounds of dark rust red. In its midst, a small rectangular town lit by gold dots. And above it all, suspended in the clear night sky, the Southern Cross, solid, stark, shining silver, surrounded by thousands of silver studs. Approaching Malaysia, we chased sunrise. The world below was still covered in a thick blanket of night blackness. Above it all we soared in the porcelain blue ceiling-less stratosphere. Past a giant cloud, dark grey with tiered gables, a temple rising up and up and up. Beyond it, the sun teased the night until it slowly appeared, a distant orange fireball. 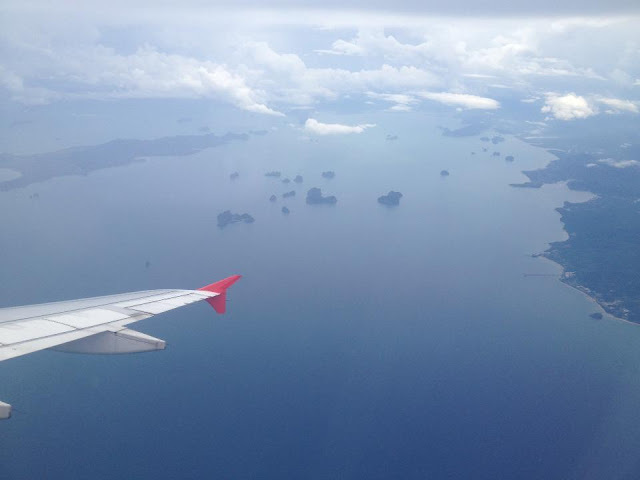 Then on the second flight, approaching Phuket, heavy rain prevented us from landing so we circle and circle and circle over Krabi and Phang Nga Bay with its monolithic lime stone karsts jutting out of the steel blue sea with its small waves dancing, foaming, fading. There is so much beauty and wonder to be witnessed in this world. We miss so much of it rushing through our days pre-occupied and absorbed in the importance of our own doing. Through travelling, I have learned that when I stop, witness and honour the beauty of this world, big or small, this is what gives my life intangible meaning and is as essential to my life as breathing. Don’t pass this world by without really seeing it. There is nothing more important than being here now. Go outside. Take off your shoes and put your feet on the grass. Touch a tree and think about how old it is, feel how still it is. Stop to admire the roses or any other blooming beauty you might pass on your way to work or on your daily errands. Go and watch the sunset or get up early and watch it rise. Go for a night-time walk and look up at the moon and the stars. Reconnect with nature and the amazing world around you and you will reconnect with a part of yourself you may have forgotten. It will change you. This, I know. I'm off to witness now. So happy and grateful to be here in this paradise surrounded by so much beauty. Thank you. Thank you. Thank you.